Christian Lopez was just another fan attending a game as he sat in Yankee Stadium on July 9th. He knew there was a good chance that Derek Jeter could reach the 3,000-hit milestone during the afternoon game and he was just happy to be a part of it. Little did Lopez know that Jeter would hit his third home run of the season to mark his 3,000th hit. Even more unlikely was that the historic ball would land right in front of Lopez. However slim the chance, the 23 year-old cellphone salesmen from Highland Mills, New York grabbed the ball and became part of history. Sometimes in life, things align to work out in a favorable way. Although fate seemed to shine brightly for Lopez, he may owe everything that happened to his girlfriend who purchased the tickets as a birthday gift. The group of five also included Lopez's father and two family friends. During the press conference after the monumental event, Jeter talked about getting the ball back. The question became what it would take to get it back. Would the person who caught the ball want money? If so, how much? Would the ball be put up for auction? Would he just hold on to it and let the demand build? The question was answered almost immediately when Lopez returned the ball for nothing. In an interview with ESPN, Lopez noted that "Mr. Jeter deserved it. I'm not gonna take it away from him." 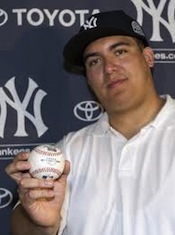 Obviously, the Yankees would not let him leave empty-handed. In addition to a personal meeting with Jeter, Lopez also received three autographed balls, bats, and two Jeter-signed jerseys. Lastly, Lopez also will enjoy four tickets to the Champions Suite in Yankee Stadium for every remaining home game this season including any playoff and World Series games. Many fans and collectors would like to be in the same situation and it was refreshing to see an individual appreciate the game for what it is. Not a chance to make money or exploit a situation, but to enjoy the game he loves and respects. Although Lopez could have likely netted a six-figure payout if he had put the ball up for auction, in the long-run, he made the right decision as a true fan and will be remembered for it. 9x12 Three Card Plaque - Derek Jeter "3000 Hits"
1994 Signature Rookies Promo Derek Jeter #S4 PSA 9. 1 of only 3000 Rare RC!